LobePro’s durable, reliable, and compact positive displacement pumps are the industry's most effective solutions for industrial and municipal wastewater treatment. LobePro positive displacement pumps are engineered to handle thick and/or abrasive materials and provide a steady flow without ragging, delaminating, or leaking. Flow N Control offers LobePro pumps in a range of sizes and configurations—our expert team will help you select the right LobePro product for your specific needs. Request a quote on LobePro positive displacement pumps, or contact us for more information. 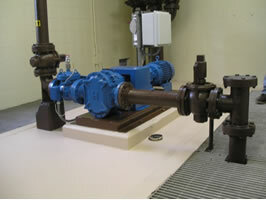 Established in 2006, LobePro is a relative newcomer in the water control and handling industry, but the quality and performance of their pumps and other products have helped them quickly establish a solid reputation and a long list of loyal customers. LobePro provides reliable positive displacement pumps for handling sludge, mud, viscous and/or abrasive fluids, and more in specialized applications including extreme high pressure or low flow environments. As an authorized distributor of LobePro pumps, Flow N Control offers a full line of LobePro pumps, with ratings up to 200psi and capacity up to 2,645 gallons per minute, making it easy to find the right solution for your needs. Contact us for LobePro positive displacement pumps.